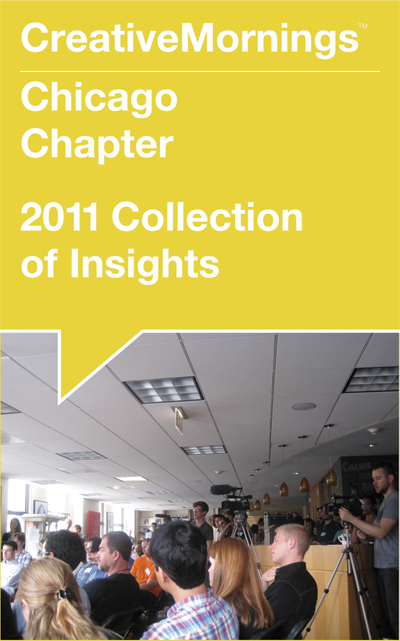 Sandra and Mathieu Holl spoke at the 43rd gathering of the Chicago chapter of CreativeMornings. The couple founded Floriole, a pastry business, whose menu later incorporated breads, sandwiches and salads. Sandra is the chef, while Mathieu is the agile generalist. 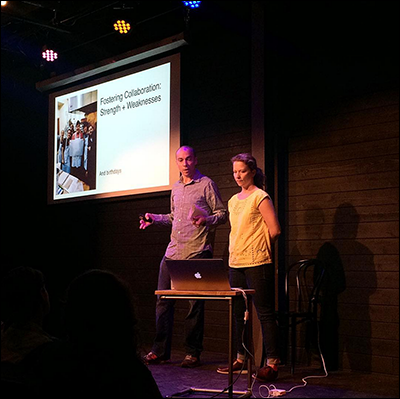 Based on their collaboration as a creative couple, they offered the audience their takes on “Collaboration,” the global theme of CreativeMornings for July 2015. Two of their statements compelled me to parse them further. Repetition gets a bad rap when it comes to work. But to dismiss it is to overlook a crucial part of the creative process. Repetition is a synonym to the mythic stature of “mastery.” Prick mastery, it bleeds repetition. Cycles of effort—repeated—is what makes creativity steer clear of monotony. Does “Artisanal Pencil Sharpening” feel boring to you? Betcha it does. You’ll judge that it’s repetitive. It is—leading to the inevitable conclusion of a person, a craftperson, passionately waiting to do the right thing on one thing, even if it’s just pencils. Or spoons, stemming from my interview with Nic Webb, who searches relentlessly for pieces of wood, reclaims them and turns each into an impeccable utensil. Or jewelry, based on my interview with Hannah Rebernick and Cara Narkun of Zealous Bee, who keep honing in on making the ideal pieces of laser-cut accessory composed of wood and acrylic. No matter how small the activity or mundane the material, repetition can yield moments of contemplation, a segue to revelation. One of the differences repetition brings, that’s particularly beneficial during the creative process, is not overthinking. Though poetic in instruction and tone, the prescribed twofer of being present and open, in regards to collaboration, commands a lot of attention. It’s an exhausting proposition. This is where collaborators can give practical relief on a project. They provide coverage of presence and openness, especially where one’s attention span doesn’t naturally facilitate. One can be certainly the exclusive channel of being mindful to the beat of being present and open. Yet collaboration is a viable way to do more, to be more—open and present. The author Aldous Huxley recommended to “dream in a pragmatic way.” Collaboration is a stimulant that converts dreams into practice. Writer Caithe Whelan claims, “I have an idea I believe in. And that’s all I need to start.” Having a collaborator (or more) could prove to be the injection of both perspective and progress a maker desperately needs. Floriole’s online “About us” section outlines an ecosystem of collaboration: venue providers, farmers, suppliers—most of all, each other. Lending a helping hand can lead to the ultimate proof of concept—teamwork. Big thanks: to Braintree, Cards Against Humanity (Host), WeWork, Onward Search, Green Sheep Water, Garrett Popcorn Shops, for being Partners of Chicago CreativeMornings #43; to organizer Kim Knoll and operations manager Kyle Eertmoed of Knoed Creative, who spoke at Chicago CreativeMornings #7; to the team of volunteers for greatly helping to make CreativeMornings happen monthly in Chicago. My coverage: view photos of CreativeMornings/Chicago gatherings; read more write-ups about CreativeMornings.